Thank you for Participating in Our LeapFish Survey! (Please see our previous post, here, for a background to this post). Friends, I want to thank you for participating in our LeapFish survey! ...while 1 person (25%) hates it. So that's a majority vote, so far, in favour of LeapFish's new search engine!...wow! You can continue to test-drive the LeapFish search engine on this site...and get comfortable using it. For those of you who have not yet gotten the chance to vote, please do so. (Voting is open until January 17, 2010). For those of you who took the time to vote...a big MOUBlog Thanks, goes out to you! We're Testing LeapFish's Web 2.0 Search Engine: What Do You Think? Friends, I've got great news! This means that you can search blogs and search for videos, images and postings on popular sites like Facebook, Twitter, YouTube and Digg, to get the latest news or opinions re what's happening globally on the Web. What's also great about LeapFish, is that it displays all your results on one page! ...No more scrolling through several pages to get to what you want! We've been testing it out, just to see how it works and we've been very satisfied with the results. You can test it out too! Just go to the right-hand-side of our blog, to the 6th section from the top, entitled "LeapFish's Web 2.0 Search (Blogs,Video's Images)"
Then type in your search term in the window provided and wallah!... you'll get your results! Please email me to let me know how it's going for you, or just respond to our poll beneath the LeapFish Search Box, to let us know. MOU Blog Celebrates its 9,074th Visitor! We at Market Opportunities Unlimited (MOU) Blog are celebrating like crazy, today! And the reason why we've been able to do this, is because of you, our loyal friends! Our statistics show that 27% of you keep returning, each month. Australia, the Bahamas, Barbados, Belgium, Botswana, the British Virgin Islands, Bulgaria, Canada, Cayman Islands, China, Dominican Republic, Estonia, France, Germany, Grenada, Hong Kong, India, Indonesia, Ireland, Jamaica, Jordan, Malaysia, Mexico, New Zealand, Pakistan, the Philippines, Romania, Singapore, South Africa, South Korea, Trinidad and Tobago, Turkey, the UK, and the USA. ...Thank you for your visits and your continued visits! Help you to generate SUPERNORMAL profits from your current customer base. Please accept our virtual gift of Gift Box Cake, as a special token of the MOUBlog love we're feeling right now. 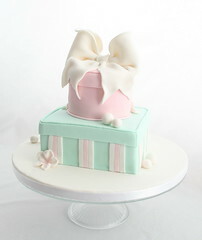 (I would like to thank cakejournal for the use of her Flickr inset photo above, of one of her lovely Gift Box cakes).